It's the last Wednesday of the month and that means it is time to show off another awesome DeNami Design stamp with a blog hop! This month we are featuring the adorable Halloween Kitty stamp. Isn't that one cute kitty? Just because she's named "Halloween" Kitty, doesn't mean you can only use her for Halloween. I wanted to share a simple card design to show that she's perfect for year-round use, too. Every single supply that I used for this card comes from the DeNami Design store! Emily Keaton <==== you are here! One commenter will be selected at random to win this month's prize! Just check out the DeNami blog for all the details. Oh, that kitty really is a sweetie...love his whiskers and turned up tail. Wonderful 'friend' card, Emily. Adorable kitty! And it makes a sweet friendship card as well!! Hope all is well your way! Love the happy colors Emily, this is as cute as can be! That kitty is just toooooo cute!! Love it! Darling card showcasing it. 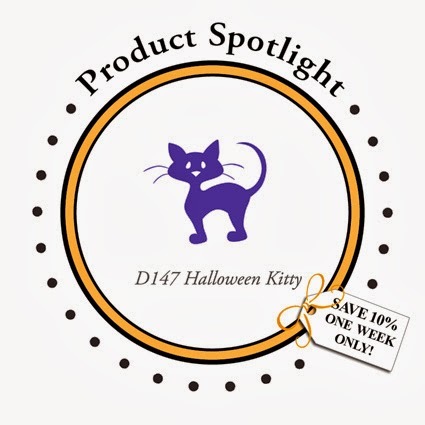 Love the Halloween kitty especially using the embossing and washi tape! Your words are so true! That's what Leah told me. Kitty's can be orange, not just black for Halloween. I love your take on this stamp! Fabulous card! I was hoping someone would show a non Halloween project with this cute kitty--thanks! What a sweet card! This would make a great gift set! Cute and simple! My favorite colored cat! This is so sweet. I love the simple design.. I absolutely love the washi tape you used on this card, so versatile. Thanks for sharing! what a perfectly cute cas kitty! i love the colors and that bow is fab! Such a sweet kitty!! The twine and tape look great! !